The IRS has made little improvement in reducing improper Earned Income Tax Credit (EITC) payments since being required to report estimates of these payments to Congress. 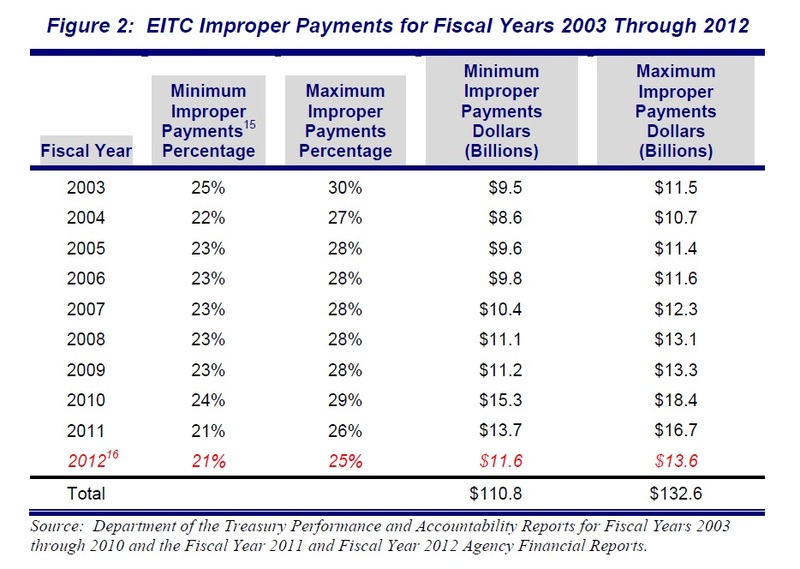 The IRS’s Fiscal Year 2012 improper payment report to TIGTA indicates that EITC payments totaled nearly $62 billion. The IRS estimated that 21 to 25 percent of the EITC payments made in Fiscal Year 2012 were paid in error. Complexity of the tax law, including the need for congressional authorization of math error authority. High turnover of eligible claimants. EITC eligibility rules are complicated and cause taxpayers to make errors while attempting to interpret and apply the tax laws to their individual situations. In addition, the changing population of taxpayers who claim the EITC increases the difficulty the IRS faces in improving EITC compliance. The IRS has conducted numerous studies showing how taxpayers move in and out of the EITC program. Studies show that approximately one-third of EITC claimants each year are intermittent3 or first-time claimants. The Department of the Treasury stated that none of the six factors listed above can be considered the primary driver of EITC improper payments. The interaction among the factors makes it extremely difficult to address the credit’s improper payment rate while balancing the need to ensure that eligible taxpayers receive the credit.